As the lead mechanical engineer, Sugarpine took over the design and was responsible for construction oversight of HVAC, plumbing, fire protection, automation, ground-source (geothermal) heat pumps, and systems integration. The estate is 54,000 sf and located in Incline Village, NV. Recently Completed, this estate has HVAC systems designed to use half the per-square-foot energy of a traditional residence. The project includes super-insulated ICF with steel construction, custom air handlers, pool dehumidification, heat recovery, snow melting, high-efficiency boilers, geothermal heat pumps, hydronic heated floors, heated outdoor living patios, energy recovery from multiple sources, and complete Revit design. Revit was used to produce fabrication drawings, materials lists, and fully coordinated construction process. 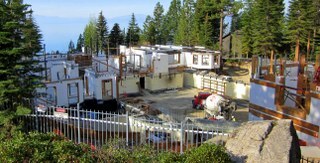 The white in the photo is all 2″ closed-cell foam, insulated concrete forms (ICF). Each wall has 4″ of foam, for a total R-value approaching 30 with no thermal bridging. A traditional 6″ wood-stud wall with fiberglass batt is lucky to hit R-16 total. Ask us about this one- it’s on the cutting edge of technologies and construction process.